How was your long weekend? I hope it was filled with fun things to do - and hanging out with your family or friends. Adrian and I had to be at 2 places at the one time over the weekend so to make it possible, I took the girls and he loaded up the surfboards with the boys for our little getaway to Noosa. But first… our little Oscar went out and kicked 2 goals at half-time at Metricon Stadium. Go, Oscar! He was over the moon he got to play with the Gold Coast Suns and meet some of the players. Definitely a dream come true for this 8-year old. Every long trip needs some nutritious (and delicious!) 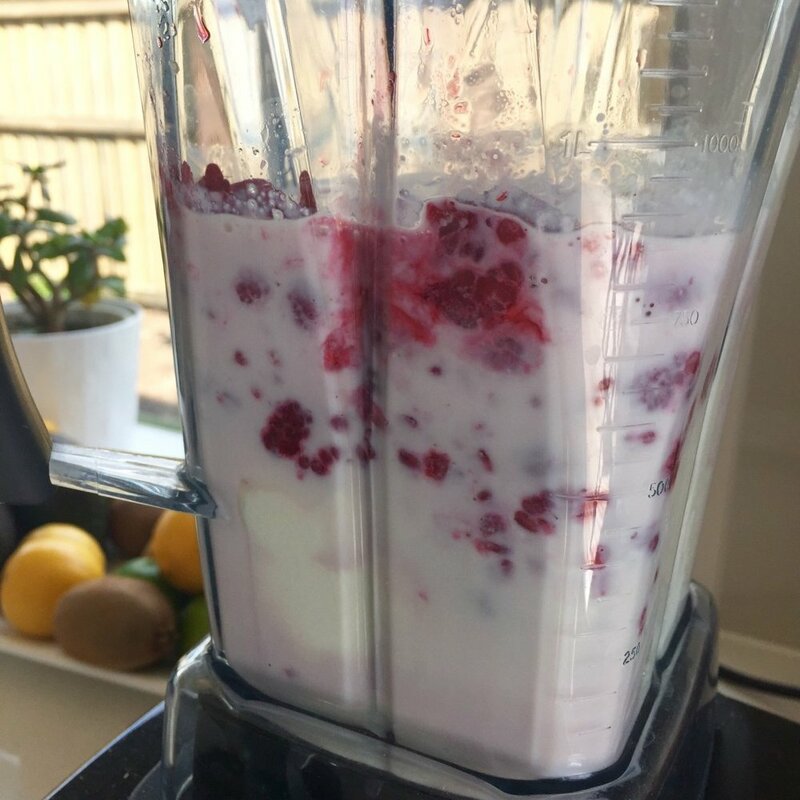 sustenance, so I made some raspberry smoothies-to-go for our trip to Noosa. On a tight schedule, a little bit of food-related planning saves a lot of stress - it saves time stopping along the way, plus, it’s much better to know we are putting fresh, healthy goodness in our bodies. Thank goodness for these secure drink holders, I say – travel is always more fun when drinks and snacks are within easy reach. Blitz in your blender and enjoy! I love how Volvo have the travel cups and tray that make life easier for us parents who do long-distance drives. We faced three hours in the car and stocking up with fruit snacks and smoothies, along with a lot of creative drawing and crafts to keep them company, definitely made the ride even smoother. We typically stay on Hastings St in Noosa, as it's a quick stroll to everything. 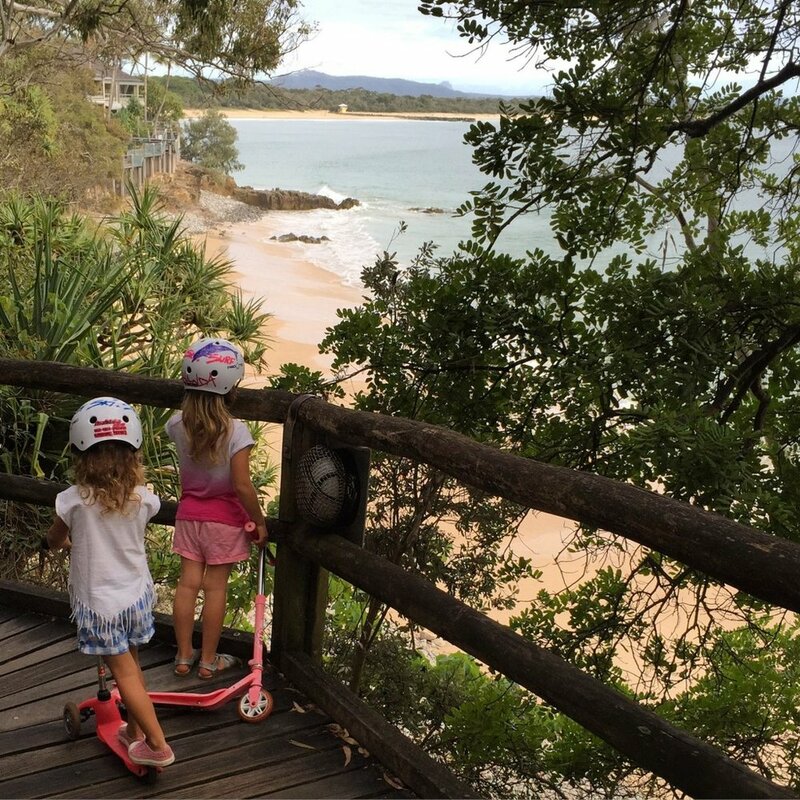 We loved playing on the beach and watching the boys surf and the girls took their scooters as we walked this amazing track. If you’ve never been there, try to plan your own holiday one day soon. Or escape to your own personal getaway spot – any place you are happy and relaxed is perfect. Eating well and keeping fit when travelling is super easy when you have kids. I get to buy fresh foods for simple snacks as we head out to walk, run, swim and squeeze in "me time" to simply stretch and get some Zen. Ahhhh. Relaxing. I also managed to complete my 2-minute move action over at YOU-app with Jamie Oliver which was a lot of fun and kept things active in a very easy way. Keep an eye out for our next "move" micro-action month. We kick it off each week with our Monday Moves inspiration to set the tone for the week. All in all, it was a fabulous little getaway and I even managed to sneak a picture with this colourful new friend I met over my morning coffee. Rainbows always make me happy and a rainbow parrot is even better. How about you? What fitness fun did you get up to over the long weekend? Remember - you can always fit in fitness when you don't even realise you're having fun at the same time. Just get up and get moving – and get your family to hang out with you while you’re doing it. ‘Together’ memories to last a (long and healthy) lifetime!